You are here: Home / Books / Dollop & Mrs. Fabulous; A Perfect Easter Gift! We received the mentioned product in exchange for an honest review. The thoughts contained within this post may vary from the thoughts of others. 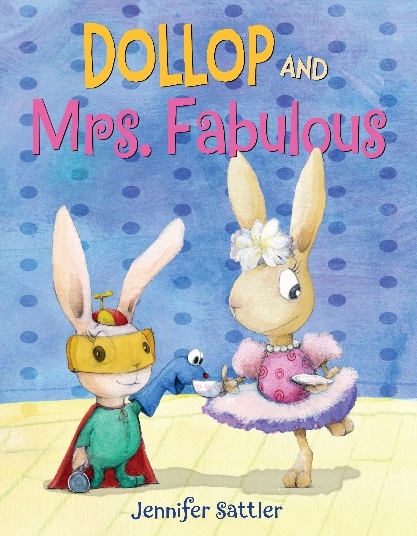 Beloved picture-book author Jennifer Sattler, creator of Chick ’n’ Pug, is back with DOLLOP AND MRS. FABULOUS (Alfred A. Knopf Books for Young Readers / On sale February 12, 2019 / Ages 3–7), a rib-tickling tale about two rabbits who are unalike in every way . . . and yet as close as close can be. It’s looking like just another boring day playing monster vs. monster when Dollop overhears her big sister, Lily, planning . . . a tea party? Lily is happy to have Dollop join her, as long as Dollop follows a few simple rules. There are no ninjas allowed and absolutely NO burping. But there is dressing up and sipping tea with your pinkie finger in the air and making mindless small talk. Suddenly what started out as a fun idea is nothing but a bunch of rules. Can these two very different sisters find common ground? Warm, wacky, and endearingly illustrated, DOLLOP AND MRS. FABULOUS extols the virtues of sisterhood and the imagination. And with adorable bunny characters, it will also make the perfect Easter gift! Our boys love books. Willie who just turned 2 spends most of his day looking at books and this one has been extra special to him. He loves “bunny book” as he calls it and has really taken to the characters. Best of all our oldest Jack who will be 6 in June also loves this. His favorite part is that a bunny can be a ninja as well. The boys have enjoyed this book so much and we have debated getting an extra copy just to have another on hand. My niece came over who is almost 4 and loves looking at our book collection, too. Having an extra copy would make for some quieter times instead of discussions on whether there was going to be group reading or sharing. This year for Easter we have really scaled back. We didn’t buy a lot of basket fillers and stuck with the basics. Reading, art supplies and some clothing. Going overboard has only made more clutter in our home and honestly has created chaos that we don’t need. Keeping things simple this year has been so much more fun and adding Dollop & Mrs. Fabulous to any Easter basket is a great idea! Available on Amazon for only $12.32 for a hardcover version (also available on Kindle) this is a great Easter choice!